The 1802 House Gnomes are here and they're ready to travel! The 1802 House Gnomes are here and they’re ready to travel! 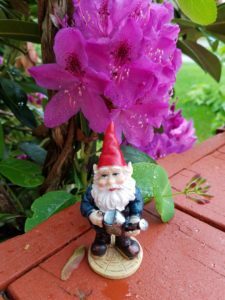 Have you heard about traveling gnomes before? The true origins of Gnoming, as it is often referred to, is a little unclear. It was popular for many years in the UK but stories differ as to when and where the “phenomenon” started. In the 1970s, a gentleman by the name of Henry Sunderland took his own gnome on his travels through Antarctica, taking pictures of them with landmarks along the way. In Australia in 1986, a suburbian woman made the news when her garden gnome was “appropriated” by travelers who left her a note from the gnome stating that he had gone off to see the world but not to worry, he would be back soon. 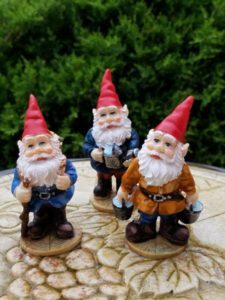 Here in the US, the most well-known instance was when a group of college kids took a gnome from a woman’s garden in Washington State and took it travelling through California and Nevada. The students named him Gnome Severson and took pictures of their gnome all through their journey. Gnome Severson made the national news when he and his companions ran into Paris Hilton at a gas station. She agreed to have her picture taken with him. The story was picked up by the national press and eventually made the cover of People magazine. We’ve purchased little gnomes for you (no stealing involved) that are only 4″ tall so small enough to fit in a suitcase. Our guests are welcome to take one traveling with them. We only ask that they take one or two pictures of our gnomes on their travels and either post to our Facebook page with a little info about what the little guys are up to, or send them by email to us and we’ll post for you. One of our gnomes has already taken off on his journey and we’re anxiously awaiting news of his travels. What a great way for us to vicariously explore and see other places with these little guys! We hope you’ll follow their travels on our Facebook page as well! When you are next visiting the 1802 House, please ask us about taking a Gnome Home with you too. See you soon. This entry was posted in General by 1802House. Bookmark the permalink.